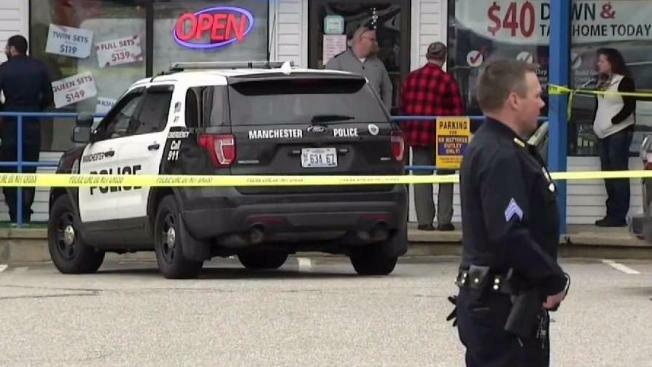 Authorities in Manchester, New Hampshire, are investigating the alleged assault of a man and robbery of a store. Police are investigating an alleged robbery that occurred at a business in southern New Hampshire on Thursday afternoon. Manchester police said a man was allegedly assaulted at 1:15 p.m. at First Nutrition, a supplement store located in a plaza at 865 Second St. The victim called 911 and made his way to Pizza Express, another business located in the same plaza. The man was taken to the hospital with non-life-threatening injuries to his head and face. Police said the suspect is 5'7", with a medium build and was wearing a dark colored jacket, dark colored hat and dark colored pants. One man who used to own a business in the plaza for 15 years knows said the area is generally safe during the day. "Oh my gosh... I was broken into twice during the 15 years that I was here. So part of it doesn't surprise me, but to this extent in broad daylight, very surprising," Scot Kinney of Bedford said. Police said a dark colored pickup truck was seen leaving the parking lot just before they arrived at the scene, but they don't know if it is tied to this incident.